The condo association, having recently replaced the building’s waterproof membrane, reached out for a design to turn the roof into an urban sun deck and grilling area. Reclaimed concrete pavers are combined with Ipe decking pavers to differentiate use areas. The social area is outfitted with a pergoal, seating, and grilling area. 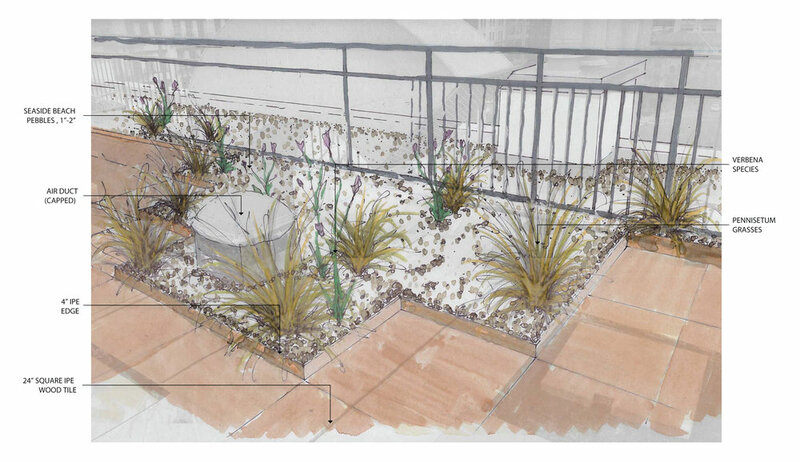 Green roof plantings, and utility screening. Working closely with the condo board and committees, we achieved a design that satisfied the needs of the residents and the management company.